Do you spend any time outdoors in colder weather? Do you have family who plays sports in sub-zero conditions? Maybe you suffer from poor circulation or know someone who does? When the temperature drops and you’re ill-prepared, there’s very little worse than not being able to feel your fingers. Even with a decent pair of gloves, the biting chill can still penetrate your defenses and leave you feeling miserable, unable to do even the simplest task, or – in a worst-case scenario – at risk from serious injury. So, before the onset of the next ice age, you might want to think about protecting your precious digits. Mittens are out – hand warmers are in. Or maybe a combination of the two. Check out this round-up of the best hand warmers out there and stop your appendages from falling off. A “handy” buyers guide will follow the review. How do the Chemical Warmers Work? How Long Does the Heat Last and How Hot do they Get? Can I Take Hand Warmers on an Aircraft? Can I Make My Own Hand Warmers? Review: HotHands are one of the leading brands of single-use hand warmers available, as well as being one of the most popular. These air-activated products will provide heat for up to ten hours and reach temperatures of around 100 degrees. They fit easily into gloves, pockets or even under your hat. Only good for one use. Ideal for emergency warmth – they’re essential in a first aid kit and the best disposable hand warmers around. Regular outdoorsmen and women might prefer something longer-term. Like a portable heater for example. Review: Incorporating a power bank and a hand warmer, this rechargeable, pebble-shaped device has three heat settings. It can reach up to 131 degrees on the highest setting, heating up in just three seconds and lasting between four to eight hours depending on use and conditions. A dedicated power bank might be better to charge your devices. A really nice idea that works well for the most part. You can’t go wrong for the price and a decent option for casual use. Review: As a brand, Zippo needs little introduction, and their portable hand warmers are arguably the market leaders. Much like their famous lighters, these all-metal warmers use a butane reservoir to power up to twelve hours of flameless heat with a catalytic burner. Six-hour versions are also available and they all come with a soft pouch for comfortable use. Another company you can trust. Requires fuel and igniter to operate. Can’t be turned off once lit. This virtually odorless design is one of the best hand warmers for hunting, but it’ll hold its own in just about any situation. How it actually works might put some people off though – see the FAQ below. 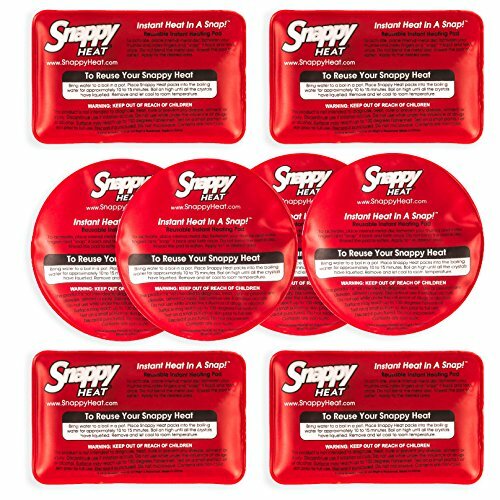 Review: Rocketing to 130 degrees inside three seconds, one of the great advantages of these heat packs is that they are reusable. Once activated, they’ll last between 10-15 minutes, and to reuse you simply boil them until the internal crystals have liquified again. Up there with the best chemical hand warmers, you can buy. If you’re needing a quick 15-minute heat boost then these packs are a great option, but for a longer lasting hand warmer you’ll need to look elsewhere. 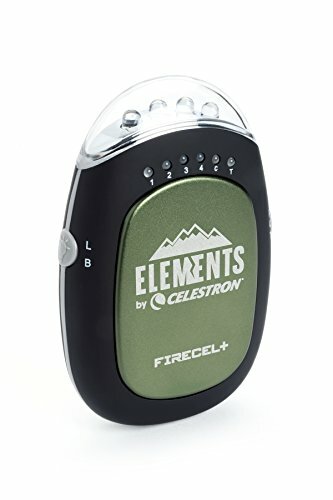 Review: A three-in-one design, this rechargeable device incorporates a flashlight which could prove to be very useful on camping trips. It offers three temperature settings and can last up to eight hours. You’ll be able to give your smartphone at least one full charge from the power bank, too. There are more attractive designs out there. A decent, no-frills unit with a handy, built in flashlight. Review: This smart, pebble-shaped hand warmer also has three temperatures, reaching up to 131 degrees. It will automatically turn off after an hour so you can save some power if required. Similar to the previous model but without the flashlight – but this is a nicer looking design. Like all these power bank warmers – you can’t charge and heat at the same time. A nice looking hand warmer that would make an ideal gift for a loved one. Review: These HotSnapz are contenders for the best reusable hand warmers and are a significant improvement on similar products because of they last longer. The green pocket warmers will go for about an hour, while the red hand warmers will last for up to 40 minutes. Boil them for 10-15 minutes to return to their liquid state and you can use them again and again. Useful pocket and hand size options. Still won’t last as long as electric warmers. Takes a minute or two to heat up. A good chemical hand warmer that’s reusable and lasts long enough to give your frostbitten fingers some relief. Again, if you’re outside for longer periods or need continuous heat, it won’t be what you’re looking for. Review: Another version of the popular pebble design, this warmer is a step up from previous models. An award-winning unit, it has a more powerful battery and will maintain 122 degrees for three to five hours. It’s a fuller, more rounded device that should be more comfortable for most hands. Slightly on the bulkier/heavier side. 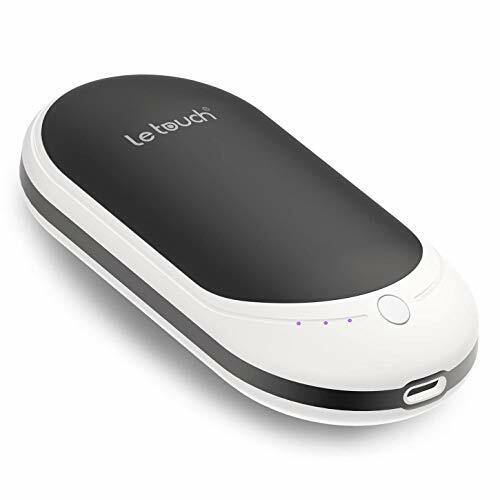 A well built, stylish, quality hand warmer that offers decent battery power. Review: One of the more powerful 3-in-1 devices out there, this hand warmer will charge your phone roughly two times and give you heat for up to 4.5 hours. 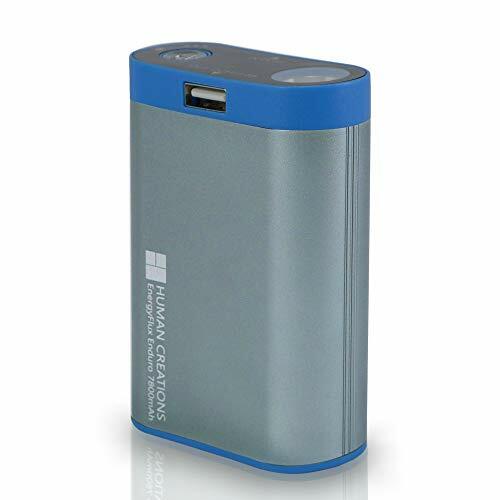 The LED flashlight is very useful and the 10000 mAh battery packs a punch. 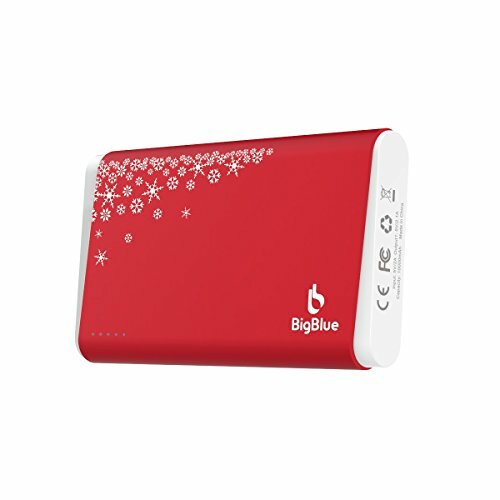 Big Blue make quality solar chargers, although I’m not entirely sure why this device comes in red. A choice of colors would have been nice. 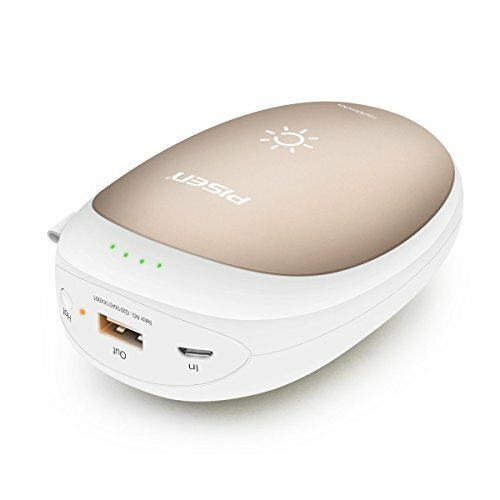 Probably one of the best electric hand warmers and power banks available. The 10000 mAh battery power really makes a difference here. 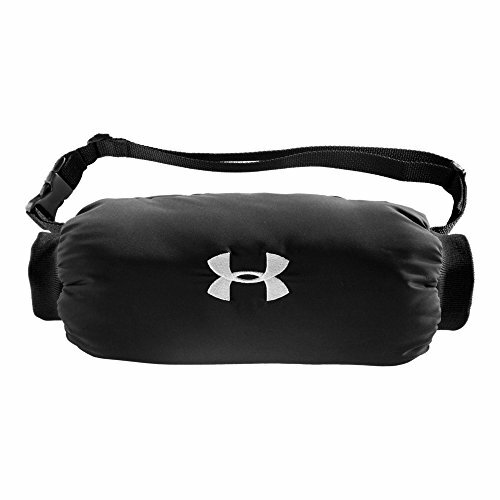 Review: Taking it in a slightly different direction and we have this Under Armour hand warmer. A reputable sporting goods company, UA are clearly marketing this at anyone who plays sports outside in freezing conditions, but it’ll work just as well for any exterior activity. You don’t need to use a chemical or electric hand warmer in conjunction with the product – but there is a dedicated internal pocket should you wish to do so. One size might not be suitable for everyone. Guaranteed to keep your mitts nice and toasty in colder weather – especially if you add a chemical or electric hand warmer. Review: Another alternative hand warmer, you heat these mittens in the microwave before enjoying the benefits. While they won’t be suitable for outdoor use, they’re perfect for in the home for anyone who suffers from health problems like rheumatoid arthritis or Reynolds syndrome – or if you just feel the chill easily. These rice-filled mittens can also be used as a cold pack from the freezer. Can’t do anything else while wearing them. A great gift for anyone who suffers any kind pain in the hands or wrists – these mitts will provide some much needed relief. Review: This pocket heat pack boasts an excellent run time of just under seven hours after a four-hour charge. 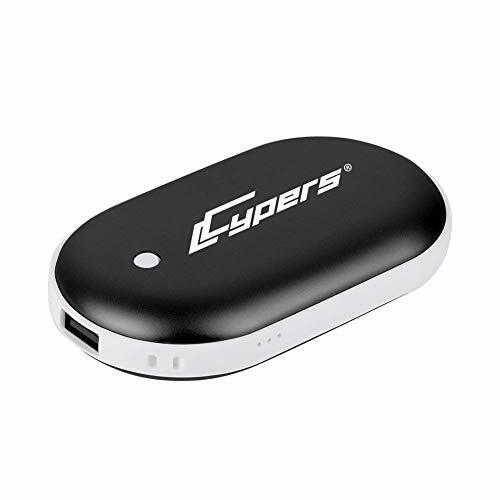 Offering a built-in flashlight and power bank and temperatures up to 115 degrees, it comes highly recommended from a number of reputable review sites – including this one! One of the best electric hand warmers on the market, this is a solidly built device that won’t let you down. Review: This Celestron offering has a nice, ergonomic design that makes it easier to hold than certain models and it lasts about two hours on the warmest setting. The LED flashlight offers a choice of modes depending on your situation. A handy device to have in an emergency. Bright flashlight with five modes. One of the best hand warmers for backpacking – the useful flashlight modes and powerful bulb will come into their own in the great outdoors. Just make sure you back it up with a decent cold weather tent. Review: Not to be confused with the previous Zippo entry, these rechargeable hand warmers offer a stylish, practical design, coupled with six heat settings and whopping nine-hour run time. It’ll also charge your electrical devices, too. You can select adjustable heat on one or both sides of the device to suit your personal preferences. Expensive for a hand warmer. 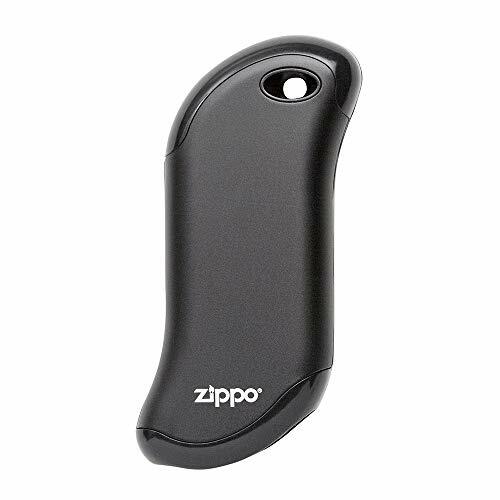 Another great option from Zippo, this time offering one of the best rechargeable hand warmers for a variety of needs. Review: If you’re looking for some serious winter protection from the elements – and you’re not concerned about the budget – you’ve come to the right place. 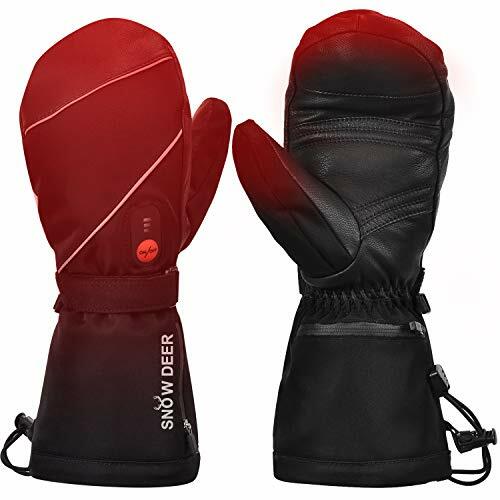 These sheep leather heated mittens are of a professional standard, offering three heat settings from their built-in lithium polymer batteries. Probably the best hand warmers for extreme cold, they’re ideal for those winter sports where you’re on the move. Useful pockets for important items. Up there with the best rechargeable hand warmers available, I doubt your fingers will be warmer using any other product here. They’ll set you back a pretty penny for the privilege, though. If you didn’t realize just how confusing the world of hand warmers really is – then the following sections are for you. Before making a choice of the type of hand warmer that would suit you best, first, you need to identify what you’re going to be using it for. If it’s just going to be a once off, or you don’t think you’ll use an electric model much throughout the year, consider picking up some spare disposable warmers – or the gel reusable kind. For more regular use, or if the product will be used for frequent pain relief and health issues – you’ll want a rechargeable device which will save you money in the long run. And if you’re frequently out in the field, camping, hiking, hunting, fishing or any kind of sport; then heated gloves or mittens might be the way to go. 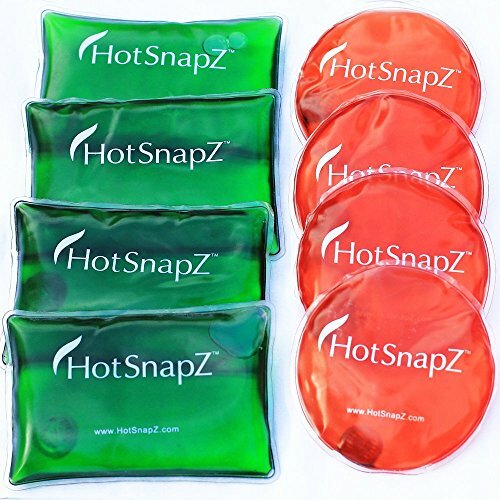 Hothands, Snappy Heat and Hotsnapz (to name but three brands) utilize a chemical reaction in their hand warmers – which usually comes in a sachet of colorful liquid. But don’t worry, it’s perfectly safe, non-toxic and environmentally friendly. Unless of course, it says otherwise – which it shouldn’t – so steer clear if it does. They can be either disposable (Hothands) or reusable (Snappy Heat and Hotsnapz), and again it’s up to you to purchase the best one for your needs. Obviously, the reusable versions will be a little more expensive. Each offers their own advantages and disadvantages, with heat lasting longer in some, achieving peak temperature in shorter times and/or generally being a hotter product. Check the reviews above for the specs of each. Supplied with a USB cable, you simply connect these hand warmers up to the mains and give them a full charge. Then, depending on the make and model, it will give you double-sided heat at the touch of a button. Most models will offer more than one temperature setting. Again, how long they last and how hot they become is determined by the quality of the product, as well as the conditions you use it in. But most rechargeable hand warmers should reach around 130 degrees in under a minute – some as fast as a few seconds. How long it takes to charge will vary too, so check the specs again to make sure you’re not waiting too long. Electric models are among the best reusable hand warmers 2019. Liquid gas – in the form of butane lighter fluid – is used to power a fuel-only hand warmer. 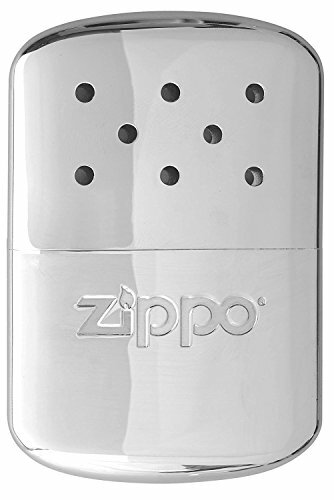 Zippo has the market cornered in this regard, and they create some of the most popular and reliable products for this type of warmer. It works by filling a plastic reservoir with fuel and then dousing the cotton swab at the top of the metal casing – similar to that at the bottom of a regular Zippo lighter. By igniting this tinder, the device will convert it to heat by means of a simple but effective catalytic converter. In spite of it being flameless, some people might be a little uneasy using such a device in their pockets. The only real downside I can see is you still need to carry a lighter or matches to “turn it on.” It’ll last for hours when it gets going, though. The kind of warmer that uses no power source, save your own body heat. Usually lined with thermal retaining materials such as faux fur, sheep’s wool or other insulated fabrics, you simply stuff your hands in and keep them there until you can feel them again. Some models (like the version included in my review) include pockets or compartments in which you can add another hand warming device like any of those listed above. The obvious advantage is that you don’t need to charge or burn anything, but they might not be the best in genuinely arctic conditions. Filled with rice or perhaps another synthetic material, these warmers can come in a variety of shapes and sizes for use all over the body – not just the hands. Pop them into the microwave, give them a 30-second boost or so and they’ll heat you up and keep you toasty in no time. One of the best options for people who aren’t going to be leaving the house and/or suffer from health issues – such as poor circulation or arthritis. Not much good in the great outdoors. Electric gloves or mittens are an excellent way to keep your hands that extra bit warmer – even in sub-zero conditions. Charge the battery at home, turn on in the field and let the current flow around the circuit ensuring your hands keep frostbite at bay. Good quality gloves and mittens won’t be cheap, but they’re perfect for winter sports or people who spend a lot of time outdoors during the colder months of the year. You’ll notice that the main “extra” offered with electric hand warmers is that they often double as a power bank. How effective these are will be determined by the size of the battery and the type of device that you’re intending to charge. It should be noted that you can’t warm your hands and charge something at the same time. Flashlights are included in some models – which can be surprisingly bright and useful when you’re fumbling around in the dark. Not to be overlooked is the size and weight of the hand warmer. Will it fit into your pocket? Will it fit comfortably into your hand? Will it slide easily into a glove? Is it pleasant to sit on and warm your bum? For the most part, hand warmers are ergonomically designed to fit into the contours of your hand, but it’s worth double checking dimensions because some are more cumbersome and bulky than others – and you might want to warm more than your hands. One thing you might notice in my review is that the prices between hand warmers don’t vary that wildly. For a decent electric device, you won’t be breaking the bank. However, as mentioned above, good quality mittens and gloves will stretch the wallet a little further. I personally wouldn’t take a chance on anything cheap if this was the type of warmer I was looking for. And the cost of disposable warmers will depend on how many you want to stock up on. A bargain initially, but you might be throwing money down the drain in the long run. Probably the number one concern for people looking to dip into the hand warmer market, the general answer is – yes, they are. Like any product, you have to use it correctly and stick to the safety advice in order to not have accidents or issues. For people who have sensitive skin, such as the young or the elderly, heat injury is often a worry. But most devices will come with protective pouches or pockets, and manufacturers advise that you don’t put any warmer directly onto the skin anyway. Even so, while they get quite hot, hand warmers won’t injure anyone given proper use. And you’re never going to get an electric shock from the glove or mitten warmers. Obviously, take care when charging any electrical device. Sticking your fingers in the socket isn’t safe at all. See below for a description of the chemical warmers. Another concern is what exactly is the reaction going on inside the disposable/reusable gel hand warmers? When you mention the word ‘chemical,’ people tend to freak out. It’s a non-toxic, non-harmful, natural and eco-friendly reaction between the ingredients inside the sealed bag. These ingredients are most likely to be iron powder, water, salt, activated carbon, and vermiculite. When exposed to air, they react in a fast exothermic oxidation process that provides the heat. Instead of iron, a reusable warmer will utilize a supersaturated solution of sodium acetate that releases heat as it crystallizes. It can be re-activated by boiling for 10-15 minutes until it returns to a liquid again. Regardless, ‘chemical’ warmers are not going to melt anyone’s hands off, even if the bag is somehow punctured. This will depend on a variety of factors. The type of hand warmer you’re using. The current temperature and conditions. What heat settings you’re using (if there are any). Obviously, you’re going to want to select a hand warmer that will get the job done – so check the manufacturer’s specs again to make sure it’s going to last as long as you need it to. While the final decision will be with your carrier/the TSA, most hand warmers are safe to travel with. The main exception will be fuel reliant hand warmers, where you’ll likely be asked to check the device in – particularly on international flights. Make sure you inquire before departure – it’s better to be safe than sorry. Hunters especially will be concerned with this, given that it might frighten a potential target away. Fuel warmers are “virtually” odorless, with some users reporting only the faintest smell of lighter fluid – and even then it’s barely noticeable. Other types of warmer don’t smell at all. The microwave rice packs can give off a bit of a niff – but you’re unlikely to be chasing a deer with your hands stuffed in one of those. If you’re feeling that way inclined, yes, you can! You can do anything you set your mind to. I hope that’s heated you all up and you’ve managed to sift through all the info on the best hand warmers to choose the right one for you. And since you’re here, why not download my free eBook on travel safety? You’ll find it contains loads of tips and advice for keeping yourself more than warm and comfortable while on the road.